Our vision is clear and simple. Provide the best possible Commercial Real Estate Service in every transaction in which we participate. The Tyson Group brings to you their knowledge of the New Bern Commercial Real Estate Market They are your New Bern Commercial Real Estate Authorities. Steve Tyson has been a Real Estate Broker for over 33 years and is a lifetime resident of New Bern. He is also a licensed General Contractor with 30 plus years of experience in building and remodeling commercial buildings as well as residential homes. His partner and wife, Jana Tyson is a CCIM,Certified Commercial Investment Member. A CCIM is a recognized expert in the commercial and investment Real Estate industry. Their clients are assured to receive the best professional help with their Commercial Real Estate transactions. In addition to information about historic New Bern and Havelock Commercial Real Estate sales, leases, and rentals you'll find many other links that will give you useful information about the area. Looking for help with a 1031 Tax Exchange Property? New Bern is a Great place to invest. There are many reasons why this is the case. Listed below are just a few. The Marine buildup at Cherry Point and Camp LeJune is estimated to add an additional 60,000 new residents to Eastern NC. New Bern offers a quality of life that makes it appealing to smaller manufacturers. The Historic downtown, close proximity to beaches and navigable waterways, numerous golf and tennis clubs and abundance of special interest clubs, organizations, and civic groups make living in New Bern a unique experience. New Bern has a regional hospital and a regional airport. Both serve many of the municipalities of Eastern NC. Commercial real estate development in New Bern has at times lagged behind the growth curve in the New Bern area and we feel the time is ripe for the right commercial development. Call us today for information on existing commercial space for sale or for commercial land that is prime for development. Airport offers daily direct flights to Atlanta and Charlotte. This makes doing business in New Bern quite easy. Click on the airplane to get information on flights to and from New Bern. Located just 5 minutes from New Bern and 15 minutes from Havelock and Cherry Point Marine Air Station, Coastal Carolina Airport serves much of Eastern North Carolina including Oriental, Atlantic Beach, Camp LeJune, and Greenville. 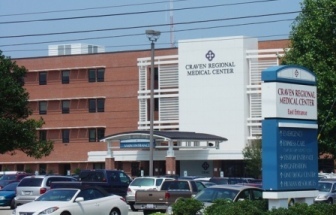 New Bern, NC has an excellent regional hospital with over 340 beds and 200 physicians. It is one of the only 5-star hospitals in NC. They have a comprehensive heart center that performs coronary bypass and catheterization. In addition they have dedicated units for cancer, intensive care, women's care, and pediatric care. The diagnostic center provides radiography, MRI, CT scanning, stereotatic mammography, bone densitomery and many other tests. The hospital has over 2000 employees and the annual payroll is over $150 million. The Tyson Group are your New Bern Commercial Real Estate Authorities. We know the area and know how to get the answers to whatever questions you need to make an informed investment decision. Steve is a native of New Bern and Jana has lived here since 1994. Steve is a licensed General Contractor in addition to being a Real Estate Broker and can help you with preliminary estimates for construction costs.